Rita Kinstler is 75, though she travels circles around most people a third of her age, including long-term backpacker-types. Rita logs 8 to 10 major trips a year, dropping in for a few weeks here and there to her home in Mansfield Center, Conn., in between global adventures. Since I met Rita on our Whales of Baja trip last spring, she’s been off to Morocco, then Ethiopia, and is now in the wilds of Alaska coming face to face with grizzlies and glaciers. This special photography-focused departure of Nat Hab’s Hidden Alaska trip, guided by Head Naturalist Eric Rock, is Rita’s 31st trip with Natural Habitat Adventures! Given the broad swath of the world that Rita has visited, it’s remarkable that she did not start traveling seriously till 1997, when she took her first Nat Hab trip. The big prompt came a year before, when Rita was diagnosed with cancer. After it became clear that she had knocked it back, Rita decided it was time to pursue her long-held dream of a safari in Africa. Her late husband didn’t share her peripatetic passions, however, and opted to stay home. Thus began Rita’s 14-year stint (and counting!) of traveling solo, within the context of small groups of like-minded adventurers. While Rita enjoys traveling in comfort, she’s hardly averse to an immersion in the wilderness with a few attendant challenges, if it means amazing encounters with wildlife. 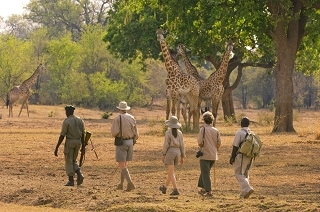 On a walking safari in Zambia with legendary guide Phil Berry, Rita recalls almost having to evacuate because of a fast-moving bush fire—but it changed direction, and she was able to continue with an intensely intimate experience of Africa and its wild creatures. Rita’s indelible memories include looking down on tigers six feet below while riding elephant-back in India’s Kahna National Park; spotting an elusive jaguar in the Pantanal in Brazil; sharing a crowded beach with hundreds of thousands of penguins and elephant seals on South Georgia Island; walking atop the Greenland Ice Cap; and seeing the bright red alpenglow illuminate the Towers of Paine during a Patagonian sunrise. But it’s a certain shaggy carnivore that remains the biggest nature draw for Rita. “I just love bears, “ she says. From the grizzlies and black bears of Glacier and Yellowstone to the polar bears of Churchill, Rita has explored all the major bear destinations of North America. 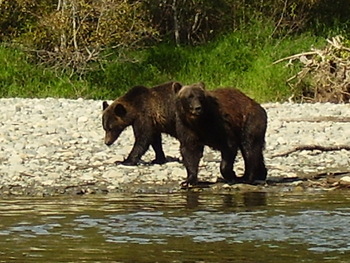 In fact, bears were Rita’s first focus with Natural Habitat Adventures, when in 1997 she traveled to coastal British Columbia to see grizzlies and the rare white Spirit Bears of Princess Royal Island. She remembers taking a small plane from Bella Coola upriver to a sandbar, then rafting downstream past grizzly bears on the banks. “We watched cubs playing King of the Hill, knocking each other over,” Rita recalls vividly. Her current Alaskan sojourn won’t be the first time Rita has seen brown bears close up: one of her most exciting encounters was watching 23 bears in a meadow in Katmai National Park. What made it extra thrilling is that she was on foot, accompanied by a highly experienced, rifle-armed Expedition Leader on Nat Hab’s Grizzlies: From Kodiak to Katmai trip. With her intrepid spirit, it’s no surprise that Rita enjoys Nat Hab’s Exploratory Trips—first-time expeditions to new destinations. “I like to be first,” she says, as she was on Nat Hab’s initial foray into Madagascar, whose lemurs, found nowhere else on earth, enticed Rita to make the long journey to the island nation off the coast of southern Africa. At home, Rita has two sons and an 18-year-old granddaughter. Rita has been instrumental in helping her create quite a collection of ethnic dolls from all over the world. What do they think of a mother – and a grandmother – who’s constantly off to places like Kamchatka and Kashgar, Addis Ababa and Antarctica, the Gobi Desert and the Peruvian Amazon? One son is a definite “city guy,” says Rita, and it’s hard for him to comprehend her passion for such far-flung wild environs. I ask her where she still wants to go that she hasn’t yet been. She’s certainly covered many of the opportunities that Nat Hab offers, though she keeps coming back for more. “Why?” I inquire. “What keeps you returning to Nat Hab? “The guides,” she says, not pondering for an instant. “They live where they work. 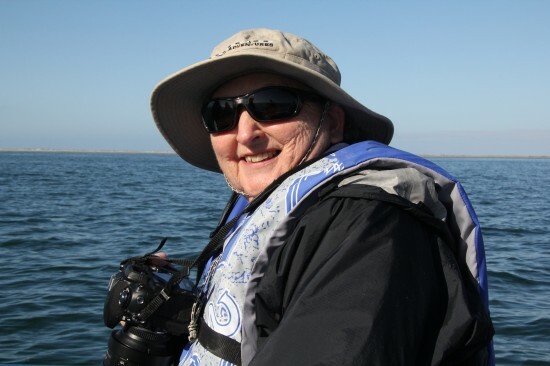 They are researchers, career naturalists.” The guides are simply as good as they get, in Rita’s view, and she has traveled with many notable companies. “And the very small groups,” she adds — the second strength that has earned NHA her loyalty over 31 trips. Rita Kinstler is living proof that adventure travel can start when you’re 60 and continue as long as your energy and desire do. And in Rita’s case, neither shows any sign of flagging any time remotely soon. May we all be so inspired. I also just returned from Alaska, and had the pleasure of being with Rita Kinstler. The amazing stories she told me, and the incredible places she has been, just knocked my socks off. The story about Rita was wonderful, and to actually know this adventurous woman made my whole trip complete. Great job Rita !! I just returned form Alaska(another great trip,good bear and whale sightings and wonderful flowers) and read your blog. As we talked during the interview it brought back many good memories of my trips over the years and you captured my feelings so well. I’m not sure I’m as intrepid as you have made me out to be, but I certainly have enjoyed myself. You write so well, and I’m looking forward to reading more of your blogs. Thank you for such a wonderful and flattering article. I just returned for Alaska( another great trip, good bear and whale sightings and wonderful flowers) and read your blog. As we talked during the interview it brought back many good memories of my trips over the years and you captured my feelings so well. I’m not sure I’m as intrepid as you have made me out to be, but I certainly have enjoyed myself. You write so well, and I’m looking forward to reading more of your blogs. Thank you for such a wonderful and flattering article.